"This new book by Richard Dolan and Bryce Zabel is an important attempt to prepare us for what will one day be inevitable: an open understanding that we are not alone. Not in this universe, and not even on Planet Earth." "I've imagined this future many times, but these guys actually wrote the book on it! Zabel and Dolan have brilliantly created a compelling blend of history and informed speculation that makes their exciting world seem like tomorrow's news today. Don't dare miss it! 'Nuff said." "What if the UFO cover-up is real and what if it ended? After Disclosure poses this fascinating question and looks at the societal consequences of such a revelation. Richard Dolan and Bryce Zabel have produced a thoughtful and provocative analysis that goes well beyond the usual scope of books on UFOs and alien life." "You may not have ever considered what life will be like after the reality of UFOs becomes publicly known. But Richard M. Dolan and Bryce Zabel have. Their book is absorbing and thought provoking. Don't miss it." "Considering the overwhelming evidence that Earth is being visited by alien spacecraft and that many intelligence agencies and military groups have known this to be true for some time, we certainly need to consider the serious question of what happens when Disclosure actually occurs. This book by Zabel and Dolan is the first in-depth attempt to answer that question. It is long overdue and sets a high standard of discussion about this very complex issue. Well worth reading." "As a physician, researcher, and creative writer, I stand on the shoulders of others to see and climb the next mountain. 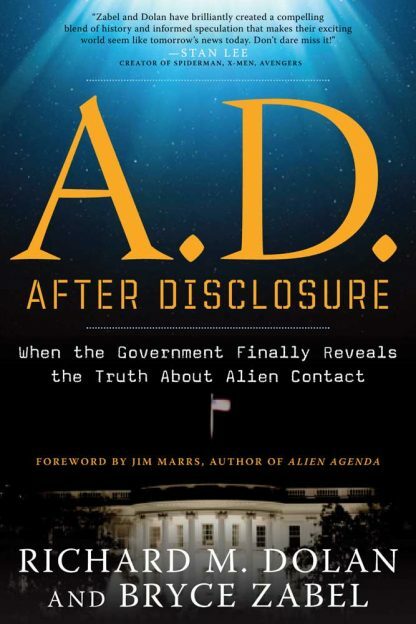 A.D. After Disclosure is a brilliant, enjoyable primer that holds a feast of ideas that will make any audience think and wonder. This work offers a place to stand where others may take up the challenge and travel to places none of us could conceive. Richard and Bryce have performed a great service both to our culture and that of the 'Others.'" "Disclosure, the formal acknowledgment by the world's governments of an extraterrestrial presence engaging the human race, is inevitable. So was this how-to book on what to do when a new world begins." "A.D. by Richard Dolan and Bryce Zabel is an important attempt to prepare us for what will one day be inevitable: an open understanding that we are not alone. Not in this universe, and not even on Planet Earth." "I've imagined this future many times, but these guys actually wrote the book on it! Zabel and Dolan have brilliantly created a compelling blend of history and informed speculation that makes their exciting world seem like tomorrow's news today. Don�t dare miss it! 'Nuff said." What if UFO secrecy ended tomorrow? The transition from B.C. (Before Confirmation) to A.D. (After Disclosure) is the ultimate �what if?� scenario in which the calendar is reset and history begins again. The first decade A.D. (After Disclosure) will be like a high-tech 1960s, spawning massive cultural and societal change. Abductees will file a class-action suit against the government for withholding critical information. All the textbooks on planet Earth�from history to science�will need an immediate review. Whether disclosure leads to social panic or ushers in a new era of unity and peace, it will undoubtedly be a game-changing event. Bryce Zabel has created five primetime network series, notably NBC's Emmy-winning UFO series Dark Skies, and worked on a dozen TV writing staffs. He has collaborated with producers such as Steven Spielberg and David E. Kelley. Zabel is a former CNN correspondent and was the first writer elected as chairman/CEO of the Academy of Television Arts & Sciences since Rod Serling. He lives in Los Angeles, California.